Streams are one of the most valuable public resources in the State of Washington. They provide the habitat for fish, an important cultural as well ecological asset. Fish bearing streams and the related habitat also are typically found within forests, important for various aspects, such as stream quality and economic values. Ironically, there is a lack of accurate data in order to properly delineate streams. Long-term sustainable harvest volume calculations, feasible harvest settings and road location design at the landscape or watershed level are critically dependent on reliable stream data. In a small project near Forks (Schiess and Tryall, 2002), stream buffer areas based on official DNR data (Hydro layer) underestimated actual stream area by an average factor of two. However, new mapping technology provides the potential of developing improved stream data from more detailed surface topology. LiDAR (Light Detection And Ranging) data which creates sub meter topography maps (Appendix A) is one technology that promises to provide increased resolution in digital surface detail compared with the typical 10 meter topographic maps and could lead to more precise and accurate maps of stream networks. Preliminary analyses showed that using LiDAR data located more actual stream channels and placed streams in their topographically correct position (Schiess and Tryall, 2002). This ability to generate accurate stream locations and physical attributes using LiDAR will allow long-term sustainable harvest volume calculations to be more reliable. In order to properly map the physical extent of channels in a watershed, the difference between processes on hillslopes and in channels must be determined (Tarboton 2003). This difference becomes apparent when calculating how water collects on a landscape in a given dataset with flow direction of the water known. In channels flow is concentrated. The drainage area, A, (in m2) contributing to each point in a channel may be quantified. On hillslopes flow is dispersed. The "area" draining to a point is zero because the width of a flow path to a point disappears. On hillslopes flow and drainage area need to be characterized per unit width (m3/s/m = m2/s for flow). 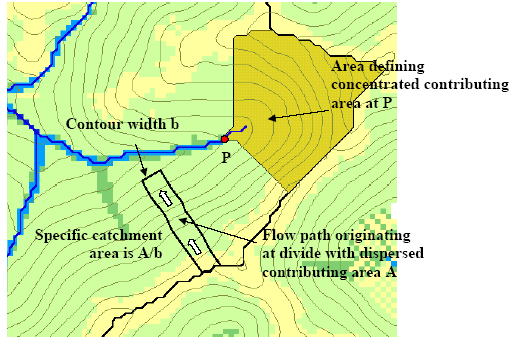 The specific catchment area, a, is defined as the upslope drainage area per unit contour width, b, (a = A/b) (Moore 1991) and has units of length (m2/m = m). (Tarboton 2003 p.1-2) Figure 1 illustrates these concepts. Figure 1. Definitions of concentrated and dispersed contributing area and specific catchment area (Tarboton 2003). LiDAR can place these physical attributes in their topographically correct position. However, locating point ‘P’ (Figure 1), the perennial initiation point (PIP), becomes a challenge due to it being dependent on the catchment area which fluctuates based on geology, climate, precipitation, and other attributes. Various hydrological models such as Simulator for Water Resources in Rural Basins (SWRRB), Environmental Policy Integrated Climate (EPIC), Groundwater Loading Effects of Agricultural Management Systems (GLEAMS), TR20, HEC-1, and HEC-2 have been used in modeling stream networks (Luijten 2000). The abundance of models demonstrates the importance given to modeling hydrologic features. During their development time, typical grid models used 5 – 90 meter DEM’s. This leads to hydrologic maps not containing the full stream network, and at times, streams that are topographically incorrect. Figure 2 demonstrates topographic error in the Washington DNR stream layer, in yellow, not extending completely up the channel. Overlaid is a 2m LiDAR-derived hillshade model that depicts the presumably correct stream courses. The DNR stream is also shifted by 300 feet to the east of the channel (Schiess and Tryall, 2002). Such discrepancies are not uncommon. This example illustrates possible inaccuracies when stream locations are determined using 7.5-minute topomaps, orthophotos, and some field verification. This was demonstrated in other projects as well and usually is recognized by field staff and planning staff as a critical issue in developing reliable forest operations designs. Figure 2. DNR stream data (yellow lines) overlying a 2m LiDAR-derived hillshade model that depicts the presumably correct stream courses. Note the discrepancies between LiDAR-derived hydrographic features and 7.5-minute-derived hydro data residing in the official data layer (Schiess and Tryall, 2002). 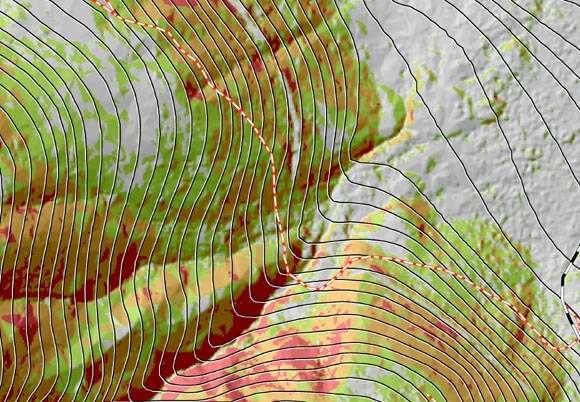 Figure 3 shows the contours generated from a standard 10-m DEM overlaid on a 2m LiDAR-derived hillshade model with slope classes from the LiDAR derived DEM. Downhill is toward the upper right. LiDAR topography provided a realistic and detailed topography. Photogrammetricly produced contour lines captured the general shape of the landscape; however, complex features such as incised streams, draws, abandoned road beds and sharp ridges were not recognized (Schiess and Krogstad, 2003). The contour lines also do not follow the stream channel accurately. Figure 3. A Lidar-hillshade derived from 2m grids versus the contours, derived from DNR’s 1:4800 photogrammetically derived maps with roads. Downhill is toward the upper right. LiDAR topography provided a realistic and detailed topography. Photogrammetricly produced contour lines captured the general shape of the landscape. However, those contour lines miss the topographically and regulatory important stream depression as indicated by the LiDAR hillshade model (Schiess and Krogstad, 2003). The advantage of LiDAR digital data over conventional photogrammetry is improved mapping in obscured areas. A LiDAR bare ground surface model containing only elevations can be obtained after filtering out the trees and buildings in the dataset. The digital data then can be used in a variety of ways including: digital terrain model for use in generating contours, 3D terrain views, fault locations, steep slopes, critical areas, and stream and drainage basin delineation (North Carolina 2003). One attempt to use LiDAR data to generate stream channels at the College of Forest Resources, University of Washington was on the South Tyee Planning Study in 2002 (Schiess and Tryall, 2002). The stream layer was produced by the “flowaccumulation” command in GRID and a uniform buffer was added (Figure 4). The stream layer could be adjusted by changing the contributing cells to the stream, which made it possible to duplicate conditions observed in the field. The contributing cell size was adjusted to a slightly higher level in order to include areas that may not have contained water at the time. It should be noted that while the GIS method of “flowaccumulation” puts streams in their expected channels, it can both over- and underestimate the stream lengths (Schiess and Tryall, 2002). This is because a uniform catchment size is defined on all stream basins when catchment size could vary from basin to basin which causes inaccuracy. Figure 4. Stream layer produced from flow accumulation model in ArcGIS with 75-ft buffer using LiDAR at left compared to DNR hydro layer with buffered widths scaled based on stream type (Schiess and Tryall, 2002). There were many discrepancies in comparing the LiDAR “flowaccumulation” streams with a DNR-Hydro layer, which is based partly on a 7.5 minute topographic generated streams in the South Tyee Planning Study (Schiess and Tryall, 2002). The 7.5 minute streams were buffered with widths based on stream type and the LiDAR streams were buffered at an average of 23m. Table 1 shows that there is a 182-ha difference between the two buffer representations. No thorough field verification was conducted, however. Table 1. Area Covered by Buffers in South Tyee (Schiess and Tryall, 2002). With better field reconnaissance and appropriate buffer widths a more accurate stream layer could be produced. However, the LiDAR stream data provided a better input for the preliminary planning process than the 7.5 minute stream data (Schiess and Tryall, 2002). The current stream data was created by the DNR and is accessible through their online database. The stream data represents an integrated network coverage (polygons and lines) that contains data on water bodies (open waters, lakes, etc.) and watercourses (rivers, streams, canals, etc.) (Hydro metadata). The data was produced using orthographic photos from 1974, topographic maps, and field observations. On March 1, 2005 a new Water Type Attribution was completed. 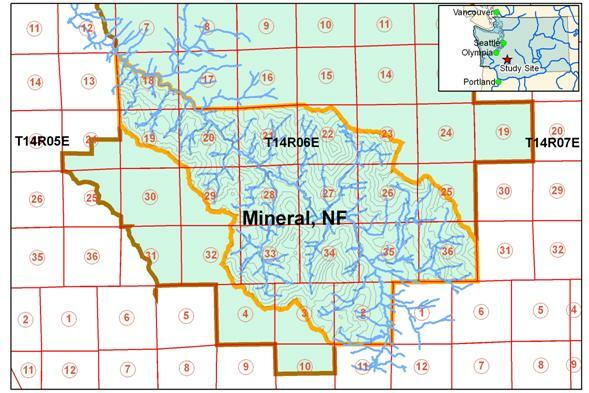 The primary purpose of the DNR hydro layer was to aid in the application of timber harvest and other forest practices regulations and activities by the Washington Department of Natural Resources (DNR). Other uses include cartography and analysis where hydrographic data is required. The physical attributes for the Water Typing model were based on a USGS 10-DEM. Using this DEM, physical barriers such as waterfalls and downstream gradient could be overlooked due to the low resolution. Furthermore stream channels predicted using aerial photos under and over estimate stream locations due to visibility. At times, the channels were topographically off from the actual location of those channels (Schiess and Tryall, 2002). Types 1-4 are considered perennial and type 5 and 9 are seasonal. The second code either describes streams as fish-bearing or non-fish bearing waters. This code was derived from the Cooperative Monitoring, Evaluation, and Research group (CMER) using the CMER Model as described in the Method / Model Development section. The same channel network is used for both code systems. Does an increase in resolution improve stream channel determination? Can stream types be determined more accurately using LiDAR datasets? Can a new algorithm be developed for identifying perennial streams? To verify that the increased LiDAR resolution improves stream modeling, different hydrologic models were tested using a 10 meter USGS and several LiDAR DEMs at various resolutions. D8, D-Infinity, Multiple Flow, and DEMON were the model algorithms used (refer to section 2.5 Flow Direction Methods Utilized). Once the models were used and data was generated from the model, field verification was carried out to verify the accuracy of the predicted stream channels. Flow direction algorithms for locating stream channels were used on various resolutions and correlated with field data. This was completed to establish which flow direction technique worked best with LiDAR data. For stream typing, the Cooperative Monitoring, Evaluation, and Research group (CMER) from the Washington State Department of Natural Resources (DNR) has established a model which predicts which streams are inhabited by fish and which do not contain fish. This model was compared to a gradient model approach which used a LiDAR DEM. Three models needed to be developed in order to decide if resolution has an effect on stream channel determinations and if stream types could be determined more accurately by LiDAR. The first model is the generation of the stream network from LiDAR DEM. The second is a water-typing model to determine the end of fish point (EOFP) from the generated stream network and the third is the perennial initiation point (PIP) model. The North fork of the Mineral Creek Watershed in the Mt. Tahoma State Forest is an area of approximately 3600-ha of forested terrain on steep topography with slopes up to 80% (Figure 5). It is located near Ashford WA, contained within T14N, R6E and T13N, R6E. This site was chosen because the Forest Engineering (FE) capstone project was located there and could provide logistical support as well as utilizing initial findings in the development of a forest transportation strategy which was critically dependent on a reliable stream location depiction. Digital datasets of the existing hydrology, cross drains, roads, fish barriers, soils, and high resolution digital elevation models based on LiDAR were obtained from WA DNR. The LiDAR dataset was flown in February 2003 and processed by the University of Washington with help from Hans-Erik Andersen and Matt Walsh (Appendix A). The DEM’s that were processed from the LiDAR at 2-m grid cell size were used for forest transportation designs as part of the FE Capstone projects in 2003 and 2005 (Schiess and Tryall, 2003; Schiess and Mouton, 2005). The mean annual rainfall in this area ranges from 2007 to 2210 mm (Daly et al. 2000) with an altitude range of 500 to 1600 m. Forest cover is dominated by Douglas Fir (Pseudotsuga menziesii) with Western Larch (Larix occidentalis), Red Alder (Alnus rubra), Big Leaf Maple (Acer macrophyllum), Western Hemlock (Tsuga heterophylla), White Fir (Abies concolor), and Black Cottonwood (Populus trichocarpa) throughout. The majority of the region’s soils belong to the Bellicum, Cattcreek, and Cotteral soil series (Soil Survey Staff, 1998). The upper part of the profile has a cindery texture from the pumice and volcanic ash aerially deposited from Mt. St. Helens. The lower part of the profile formed in colluvium, alluvium or glacial till from andesite with a mixture of pumice and volcanic ash. In general, these soils have low fertility and water-holding capacity and often occur on unstable slopes. The geology is categorized by Oligocene-Eocene (OEvba) and Oligocene (Ovc(oh)) defined as basaltic andesite flows and volcaniclastic deposits or rocks. The type of streams that were modeled included all segments of natural waters within the bankfull widths of defined channels which are either perennial streams (waters that do not go dry any time of a year of normal rainfall) or were physically connected by an above-ground channel system to downstream waters. In extracting networks from DEM’s, Tarboton et al. (1991) suggest that the network extraction should have properties traditionally ascribed to channel networks and have as high resolution as possible. A LiDAR-generated DEM provides this high resolution and the physical properties, such as channel depth and slope, associated with a stream network. Two preexisting logistic regression models were used to identify potential fish habitat. The CMER Model takes into account several physical attributes while the Gradient Model focuses on the gradient of the landscape. LiDAR DEM data was used to generate the attributes needed to apply these models. 2.3.1 CMER Model The CMER Model was used to identify potential fish habitat. Based on previous research, this habitat-based, water-typing model was developed using logistic regression analysis and GIS data which incorporated the results of field surveys (Conrad et al., 2003). 4. Precipitation in inches (GIS derived estimate of average annual precipitation at the point based on Daly et al. ). These four physical attributes associated with each EOFP point were the variables available for the logistic regression model building process. Equation 1 is the response function where is the estimated probability of fish presence. Equation 2 is the linear model where the variables are described in Table 2 (Conrad et al., 2003). The CMER Water-Typing Model was applied to the LiDAR DEM in the same manner it was applied to the 10m DEM. Downstream gradient (DNGRD), Elevation (ELEV), and Basin Size (BASIZE) were determined by LiDAR using the LiDAR-derived stream network and elevation model. Table 2 provides the results of the logistic regression model (Conrad et al., 2003). where B1 is the Gradient Coefficient at -0.209 and B0 is the Model Constant at 2.765. Logistic regression calculates the probability of success identified as (i.e., trout presence, 0.50) over the probability of failure (i.e., trout absence, < 0.50). The perennial initiation point (PIP) is the point where perennial flow begins on a Type 4 Water. Type 4 Water means all segments of natural waters within the bankfull width of defined channels that are perennial non-fish habitat streams. The model for PIP was developed in a GIS framework, whereby the measuring and recording of geomorphic stream characteristics were done by GIS at grid-center points along a LiDAR digital elevation model (DEM) generated stream network. Perennial initiation point standard is defined in WAC 222-16-030(3) and 222-16-031(4) of the Washington State Register. For western Washington sites not in any coastal zone, Type 4 waters begin at a point along the channel where the contributing basin area is at least 21-ha. 1. Basin size – Using SAGA (System for Automated Geoscientific Analyses, a GIS system) (Appendix F) the algorithms described in the Stream Model section were utilized. 2. Downstream gradient - Using the 2-m LiDAR DEM, focalmin was used in ArcMap GIS 9.0 Raster Calculator using 100 meter mean. The 2-m DEM was then subtracted by the focalmin output and divided by 100 meters. 50 is 100 meters in mapping units for 2m grid cell size and 328 is 100 meters in ft.
where CR is crown radius and H is height (Oladi 2001). A crown cover layer was created by buffering each point using the size of the crown radius and converting the resulting polygon coverage to a grid. Individual tree crown density was determined by taking an 11-m buffer around the tree point and dividing the area of the crown within the buffer by the area of the buffer. Figure 6. Plan view at a stream channel showing points generated 15 meters upstream and downstream of the stream head with physical attributes associated with the head. This is to produce a binomial linear regression model identifying perennial and non-perennial parts of a stream network. The points upstream represented non-perennial flow as the points downstream represented perennial flow. Using binary logistic regression and setting 0 for non-perennial and 1 for perennial, the physical attributes associated with each point were used to develop Equation 1 from above and equation 4.
p is the number of predictors. After the model equation was applied and the values less than 0.5 (non-perennial, < 0.50) were removed in Arc, regiongroup in ArcTools was applied to find the continuous parts of the network. The grid was then converted to an .asc file and imported into SAGA (Appendix F). Channel Network in SAGA was applied and the vector linear stream network was created. After applying the model equation in Arc, probability of non-perennial was adjusted from 0.5 to around 0.97 for a conservative approach. This was determined by looking at the histogram in the classification class and moving the class line to the highest possible number without removing the stream network. Regiongroup in ArcTools was then applied to find the continuous parts of the network. Spatial processing has a limited number of raster-based procedures. Collectively, these raster-based procedures implemented in ARC/INFO utilize the single flow direction (SFD) algorithm (O’Callaghan and Mark 1984). It calculates flow direction as the steepest slope direction, which is determined by the Maximum Downward Gradient (MDG) (Figure 5). This SFD algorithm, also known as the Direction 8 or D-8, is widely used on DEM data analysis and GIS software (e.g., the “Flowdirection” function in ARC/INFO GRID) (Jenson and Domingue 1988). The D-8 raster procedures form the basis for describing and modeling water flow through a digital elevation data set. Using the D-8 directional information associated with each cell, a network of flow from one cell to the next is represented. Using the flow direction information, the number of cells that flow into any cell is tracked and assigned to the cell. Multiple Flow Direction (MFD) algorithm is the third method that was used for determining flow direction. Once it is determined how water flows across a landscape, a flow accumulation value can be assigned to each cell showing how many cells are upstream from it. This simulates water as it accumulates going down hill to a stream channel. A user-determined accumulation cell threshold value identifies those cells that have concentrated flow and those cells that do not have concentrated flow. This threshold value defines the catchment size required for flow to become a stream channel. Montgomery and Dietrich (1992) found that landscape dissection into distinct valleys is limited by a threshold of channelization that sets a finite scale to the landscape. This threshold determines the number of sub-basins that exist in the model. A small threshold results in a large number of small basins whereas a large threshold results in a small number of large basins. The threshold is equal to the hillslope length / accumulation that is just shorter than that necessary to support a channel head (Montgomery and Dietrich 1992). A threshold-based approach is most appropriate for modeling channel head locations over shorter, geomorphic time scales (e.g. 102-103 years) than modeling valley development (e.g. 104-106 years) (Montgomery and E. Foufoula-Georgiou 1993). Many programs were used to implement the different flow direction models on a LiDAR DEM. SAGA (System for Automated Geoscientific Analyses) was the main interface used while ArcMap, TauDEM (Terrain Analysis Using Digital Elevation Models), and TAS (Terrain Analysis System) were used to verify that SAGA was performing the flow direction models properly (Appendix F). The reason that SAGA was used instead of other programs was its ability to store grid files in memory. Memory storage allowed the data to be compressed saving computer memory to permit more demanding tasks such as computing flow direction algorithms. The LiDAR DEM had to be broken up into individual sub-basins for the other programs to use the data. Because of the computational demand of DEMON, the 2-m LiDAR DEM had to be divided into the basin specific for the study site for SAGA to utilize the dataset. Evaluation of the DNR hydro layer consisted of selecting two watersheds within the study site and confirming the DNR stream types correlated with what was out in the field. When an error in correlation existed, the proper stream type was determined in the field to identify common problems within the DNR hydro layer. Field locations were sampled to test the accuracy of the current DNR hydro layer, various models used with the project, and evaluate the creation of a new stream model. Table 3 lists the features collected with Table 4 listing the associated attributes of those features. Table 3. Stream parameters identified and collected in the field. The information was logged together with GPS coordinates. Table 4. Fish presence or absence, % gradient and fish barrier type was logged with each stream feature type. Field planning was done by using LiDAR streams with the DNR hydro layer to locate stream features in the field. The above values were then determined and logged using a Trimble ProXRS GPS unit. 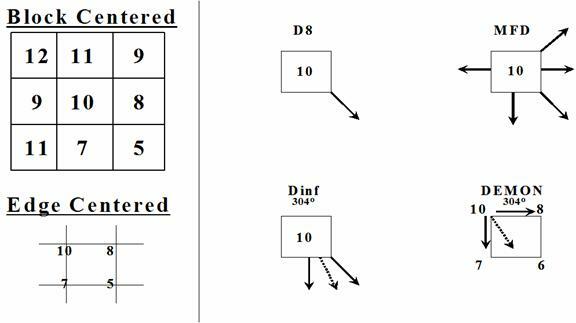 The ranges for width and water depth for each stream feature were evaluated (Table 4) as well as the possible values (Table 4) that the features could have associated with it. Fish presence was assessed only by visual inspection of the stream. If a stream did not contain much water, contained many fish barriers, or went underground, it was assumed that no fish would be present. Field work was done April 20th through May 3rd 2005. The D8, Dinf, MFD, and DEMON predicted stream channel locations differently. The major difference in stream channel determination was in hillslope interpretation. Differences between D8 and DEMON decreased as resolution increased. From visually inspecting Figure 8, a 1:1 relation between D8 and DEMON at the 2-m resolution was shown using regression correlation, when a stream is defined as a 5-ha (13.2 (ln ft2)) basin. The models do not begin to correlate until 30.4-ha (15.0 (ln ft2)) at the 10-m USGS resolution from Figure 9. As resolution increased, the spread of the points in those figures becomes more confined to the lower left corner indicating the correlation between D8 and DEMON flow direction models. Table 5 summarizes the relationship between D8 and DEMON algorithms at various resolutions. No correlation can be determined with any combination of the other flow direction models with respect to increased resolution (Appendix G). APPENDIX G provides the plots of catchment area at all resolutions with the flow direction models used. Figure 8. Cell plot of entire catchment area for a 2-m LiDAR DEM at the study site (Natural Log Values). D8 and DEMON correlate well above a threshold of approximately 5-ha as shown with the red mark. Below the 5-ha mark, differences are shown by the scatter. Figure 9. Cell plot of entire catchment area for the 10-m USGS at the study site (Natural Log Values). D8 and DEMON do correlate although not until a catchment area of approximately 30-ha is acceded as shown with the red mark. Below the 30-ha mark, differences are shown by the scatter. Table 5. Relation between D8 and DEMON algorithms at various resolutions. As resolution is decreased, the correlation between D8 and DEMON becomes less. Basin size values determined by visually inspecting the plot of catchment area figures. Using LiDAR datasets, D8 determines stream networks as well as DEMON. Endreny and Wood (2003) gave 2D-Lea (a building block in DEMON) the highest ranking in accuracy in comparison to any stream model that was used in their study. The data suggested that increased DEM resolution decreased the need for sophisticated models, reducing processing times required by complex models for high-resolution DEM’s. Since D8 is the most commonly used model and simplest to implement, computational time in computing stream networks is reduced in comparison to DEMON. When comparing a LiDAR derived 10-m DEM with a USGS 10-m DEM, D8 stream channels with a catchment size of about 12-ha and greater somewhat converge between the two DEM’s (Figure 10). When catchments are less than 12-ha, no convergence existed. Since a USGS 10-m DEM contained topographic errors in regard to stream channel location, streams from the LiDAR and USGS were categorized as identical if they were less than 90-m apart to decrease error between the two datasets. This caused differences to decrease significantly between the two stream networks (Appeddix H). These differences occur in Strahler order 1,2 and 3 streams. The area in the lower middle of Figure 10 corresponds with areas when that the 10-m USGS under predicted stream channels in comparison to the area to the left side of the figure which corresponds to areas of under prediction of the LiDAR 10-m. Figure 10. The D8 flow algorithm applied to the USGS and LiDAR Generated 10-m DEM. Illustrates that stream channels with a catchment size of about 12-ha and greater somewhat converge between the two DEM’s with regards to D8. When catchments are less than 12-ha, differences in stream channel location are shown by the scatter. As the DEM resolution increased, D8 model sensitivity also increased. At the 2-m resolution, a road crossing a stream is seen as a dam therefore routing the stream onto the road (Figure 11). The road influence alters stream location and extent. To correct this problem, known culvert locations, stream or ditch culverts at the study site were used to make the stream continue under the road. The LiDAR DEM was lowered in elevation at the culvert locations to cause the stream channels to flow to the culverts and away from the road. Culvert data causes the streams to flow to the main channel thereby minimizing road effects (Figure 12) (Schiess and Tyrall, 2003). Decreasing the LiDAR-DEM resolution to 6-m removed the road effect and placed streams in a more realistic location than the 2-m uncorrected. At 6-m resolution, the stream models could not identify roads or the ditches associated with the roads. As the LiDAR-DEM resolution decreased, road influence decreased. Stream channels, for the most part, followed the corrected 2-m stream network (Figure 13). The advantage of the 6-m LiDAR-DEM was that it provided a significantly improved stream network compared to the 10-m USGS DEM and removed the need for culvert data. Figure 11. Streams generated from the 2-m LiDAR-DEM, in red, without using culvert correction. Stream culverts are circled, ditch culverts are triangles. At the 2-m resolution, the models defined some roads as stream channels bypassing the stream culverts (arrows). Figure 12. Streams generated from the 2-m LiDAR-DEM using culvert locations. Stream culverts are circled, ditch culverts are triangles. Culvert data causes the streams to flow downslope of the culvert allowing the stream to travel to the main channel more accurately. Figure 13. At 6-m resolution, the stream models did not route streams along roads and ditches. Removing the road effect placed streams in a reasonable location. Of the streams that the WA DNR identified as Type 9 (section 1.3), 72% were observed as not containing water. Half of those did not even contain an identifiable stream channel. The other half could be considered seasonal even though water erosion was not present. The remaining 28% that contained water also contained a perennial initiation point. Very few of the streams typed as 5 were dry and most were perennial. Figure 14 illustrates field verified perennial streams identified using 6-m LiDAR DEM versus what the DNR considers perennial. Not all streams were visited due to stream head inaccessibility. There is a 530% increase in perennial stream length going from the DNR hydro layer perennial steams to the field verified perennial streams (Table 6). If a uniform buffer of 30 meters, a standard DNR regulation estimate, was placed around the stream channels, there would be a 350% increase in buffered area. Figure 14. 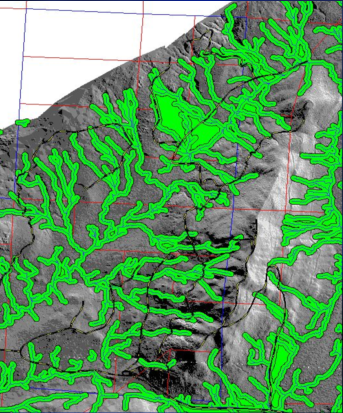 Field verified perennial streams using LiDAR in green vs. what the DNR considers perennial in blue. Table 6. Differences in perennial stream length between DNR hydro layer and the LiDAR stream network derived from 6-m LiDAR DEM. 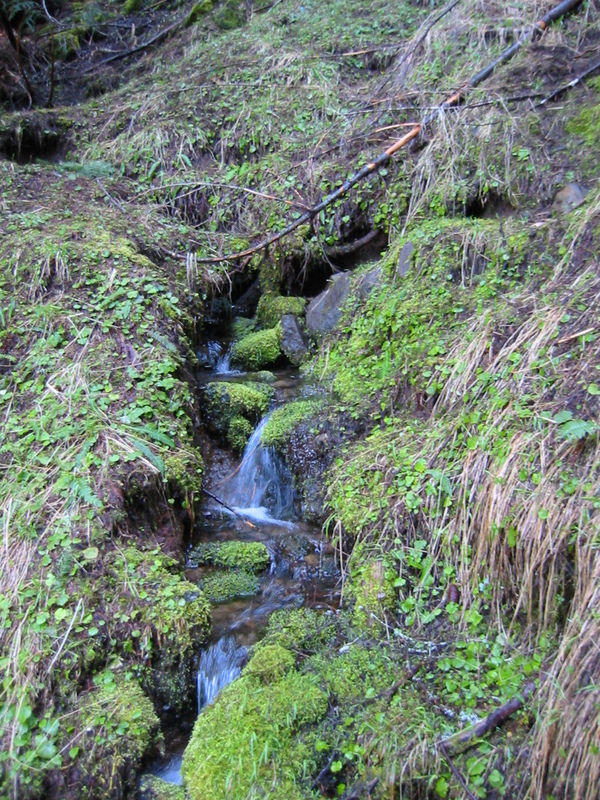 Given the soils geology and topography of the Tahoma State Forest, perennial flow began when ground water surfaced to form a stream head (Figure 15). Almost 90% of the stream heads located in the field fit this description interpreted as a spring (Figure 16). Figure 16. Spring identified as a stream head in the field. 53 heads were selected at random within the study site to be used to create a model to predict perennial initiation points (PIP). Table 7. Sub-Basins used in perennial head identification with the number of stream heads visited in the field. Figure 17. Stream heads in green within the study site. Stream channel generated from the 6-m LiDAR-DEM. The final Linear Regression model for PIP used fewer variables than expected. The final model selected Basin Size using D8, Percent Slope, and Precipitation. Downstream gradient, forest density, elevation, and site class could not be used to create the equation for determining the probability of stream head locations based on a 0.05 significance level. Table 8 summarizes the variables uses for the regression. The Hosmer-Lemeshow chi-square statistic for this model was 10.262 and the -2 Log likelihood statistic was 80.130. Self-classification accuracies for this model were 77.4% for perennial flow and 88.7% for non-perennial flow. APPENDIX I provides further statistics regarding regression. Table 8. Summary of the final logistic regression model. Using a model based on basin size alone for predicting perennial stream channels would be less accurate than the above model. The Hosmer-Lemeshow chi-square statistic for basin size model was 8.864 and the -2 Log likelihood statistic was 91.840. Self-classification accuracies for the basin size model were 77.4% for perennial flow and 84.9% for non-perennial flow. 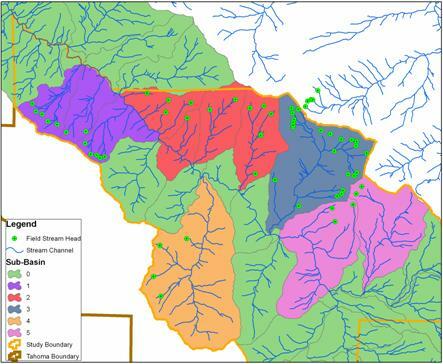 Overall, the average basin size for perennial flow for this model is 1.28-ha (3.16 acres). Both models can over estimate the extent of perennial stream channels by placing flow upstream of the PIP. Using the conservative approach described in the PIP Model section it has the potential to under predict perennial flow. Using average basin size determined from the field data, the average value is 2.2-ha (5.44 acres). This average over and under predicts perennial flow. Since the Washington State Register defines contributing basin area as at least 21-ha (52 acres), all models and approaches would significantly correct WAC estimations. The model in Table 8 was run at 4 different resolutions, 2-m, 6-m, 10-m LiDAR and a 10-m USGS DEM. Figure 18 illustrates the change in distance between modeled stream head location and field-verified stream head location for different DEM resolutions. This indicates that at all LiDAR resolutions, the error is relatively the same. The 10-m USGS DEM average distance and spread are higher than the LiDAR. This confirms that LiDAR improves upon modeling stream heads more accurately than a 10-m USGS DEM. The reasoning for high distances in the figure is due to the model not predicting a stream where the field verified stream head was located. Figure 18. The distance error between modeled stream head location and field-verified stream head location at a given resolution. This indicates that at all LiDAR resolutions, the error is relatively the same. The 10-m USGS DEM average distance and spread are significantly higher than the LiDAR. The PIP Model was tested on the various flow direction techniques listed in the “Flow Direction Methods Utilized” section to test which flow direction algorithm worked best in locating perennial flow. Because of the differences in the MFD and Dinf from D8, a separate bilinear regression model was created but none of the variables were significant based on a 0.05 significance level. The regression model in Table 8 was then used on the various algorithms on a 6-m LiDAR DEM to see the errors in predicted stream head locations. DEMON and D8 stream heads correlated in the difference in distance from the field-verified stream heads. Dinf and MFD increased in the difference in distance from field stream heads when compared to D8 (Figure 19). Finding a way to develop a bilinear regression model for Dinf and MFD would reduce the data error illustrated below. Figure 19. The distance error between field-verified stream heads and various flow direction modeled streams. DEMON and D8 correlated in error while Dinf and MFD significantly increased in error. The CMER Model and Gradient Model estimated fish extent differently. CMER Model used basin area, downstream gradient, elevation, and precipitation, while the Gradient Model uses only downstream gradient. With field verification, the Gradient Model located fish barriers providing accurate fish habitat maps. The CMER Model tended to place potential fish waters well upstream of waterfalls and culvert barriers. Overall, the Gradient Model predicted fish extent closer to the main channel than the CMER method. Figure 20 displays a longitudinal profile of a selected creek generated by a LiDAR DEM. The red zones indicate field verified waterfalls and culvert/road locations that the Gradient Model identified. These waterfalls can range from 1 to 6+ meters tall. If trout were able to pass these barriers, the CMER Model would be correct in its estimation. Figure 21 shows the predicted fish habitat estimated by the Gradient Model. The CMER Model and DNR Hydro layer are within the predicted fish habitat area but overlook small, but critical segments that act as fish barriers. Gaps in between the green zones are the waterfall and culvert barriers. These results were similar to the results for other stream channels throughout the study site. Figure 20. Longitudinal Profile of a selected creek. (Distance from main channel) The red zones indicate field verified waterfalls that the Gradient Model identified as well as culvert/road locations. Figure 21. Stream Channel used (red) from Figure 20. This shows the predicted fish habitat in green estimated by the Gradient Model. The CMER Model and DNR Hydro layer are within the predicted fish habitat area but overlook small, but critical segments that act as fish barriers. Gaps in-between the green zones are the barriers. The CMER Model and the DNR Hydro layer predicted fish presents further up stream than the Gradient Model. Using the Gradient Model, fish-bearing streams decrease 24% from the DNR Hydro layer (Table 9). The CMER Model potentially overestimates fish-bearing streams by 54% when compared to the Gradient Model. Table 9. Predicted Fish-Bearing Streams within the Study Site using different techniques. The LiDAR DEM modeled fish barriers more accurately than a 10-m USGS DEM (Figure 20). At times, the USGS dataset resulted in incorrect locations for major waterfalls. In many cases, major waterfalls were not identified at all. For the most part, the USGS DEM identified the larger streams at the study site as accurately as the LiDAR DEM. This makes sense considering how the USGS DEM was created. Large streams are visible from aerial photos allowing elevation readings to be fairly accurate. Having a LiDAR DEM dataset provides the ability to model stream channels with their respective stream head location more accurately compared to using the standard 10-m USGS DEM. LiDAR DEMs also allow for more accurately locating potential fish barriers. Currently, less than 1/5 of Washington State has LiDAR coverage limiting the ability to model stream networks across large portions of the state. The DNR as well as the timber industry appear to be set on rapidly expanding there LiDAR coverage which would eliminate this problem. Current spatial information usually does not have the fine resolution of a LiDAR dataset. Soils surveys, geology, and site class information are at lower resolutions than LiDAR so trying to develop a model that uses those themes could be difficult. These datasets would need to be at a higher resolution to better match a LiDAR derived dataset. The lack of a high-resolution site class map may explain why site class could not be used in the perennial stream regression model. The major limitation to the regression model used to predict perennial flow is that it is site specific. While it proved to be more accurate than the current datasets available, accuracy may decrease when applying the model to a variety of landscape types. Data collected on a larger, more diverse area would generate a model better able to model landscapes. In the middle of Figure 21 just below the “CMER Hydro End of Fish” label, a series of stream channels were identified in blue. This is a misrepresentation of the landscape due to dense forest canopy. A dense canopy will limit the amount of laser ground returns causing a loss of resolution in specific locations. A way to correct this problem would be to conduct field surveys of the landscape at those locations. When used with high-resolution DEMs, the most common and least sophisticated algorithm to locate stream channels based on flow, D8, proved to be sufficient when compared to more complicated and process demanding algorithms. The advantage of D8 is that most programs like ArcGIS come standard with this algorithm to locate stream networks. In generating stream data using LiDAR, a computer with a high-speed processor is not necessary. Increasing surface topographic resolution allowed an increase in the precision of stream channel modeling. 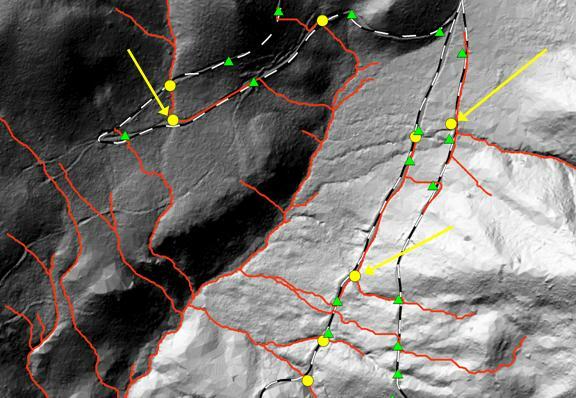 Since the LiDAR DEM that was used for this project was at a 2-m resolution, decreasing the resolution of the LiDAR did not alter the ability to model locations of stream channels. The resolution at 2-m proved sensitive for the models used requiring a culvert dataset to alter stream flow off the road networks. Decreasing resolution to 6-m eliminates road effect errors. Relying on the resolution of a 10-m USGS DEM proved inadequate in modeling head water streams. High-resolution DEMs are necessary to accurately model stream networks. 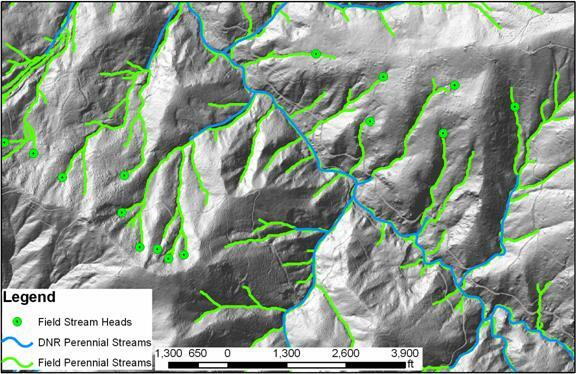 As shown, a LiDAR DEM is a great source for generating hydrologic data by identifying probable perennial stream channels and locating fish barriers along a given stream. The ability to accurately model headwater streams and identify fish-bearing streams allows stream buffer zones to be in their topographically correct location. In turn it will allow for better planning at both the strategic (sustainable harvest volume calculations) and tactical or map scale level (forest operations planning at the watershed level) rather than having to rely on time-consuming field reconnaissance. Conrad, R.H., B. Fransen, S. Duke, M. Liermann, and S. Needham. 2003. The development and assessment of the preliminary model for identifying fish habitat in western Washington. Draft report prepared for Washington Dept. Natural Resources Instream Scientific Advisory Group. Damian, F. 2001. Improving cross drain culvert spacing with GIS interactive design tool. The International Mountain Logging and 11th Pacific Northwest Skyline Symposium. Haugerud, R.A., and D. J. Harding. 2001. Some algorithms for virtual deforestation (VDF) of LiDAR topographic survey data. International Archives of Photogrammetry and Remote Sensing. XXXIV-3/W4, p. 211–217. duff.geology.washington.edu/data/raster/LiDAR/vdf4.pdf (March 2003). Latterell, J. J., R. J. Naiman, B. R. Fransen, and P. A. Bisson. 2003. Physical constraints on trout (Oncorhynchus spp.) distribution in the Cascade Mountains: A comparison of logged and unlogged streams. Canadian Journal of Aquatic and Fisheries Sciences 60:1007-1017. Montgomery, D. R. and W. E. Dietrich. 1992. Channel initiation and the problem of landscape scale. Science, 255: 826-830. Moore, I. D., R. B. Grayson and A. R. Ladson. 1991. 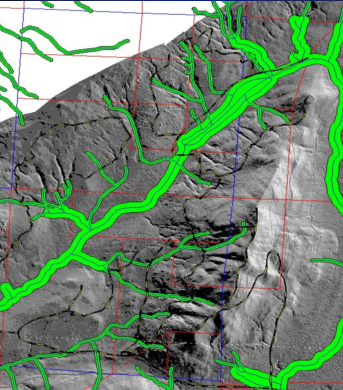 Digital terrain modelling: A review of hydrological, geomorphological, and biological applications. Hydrological Processes, 5(1): 3-30. Pan, F., C. D. Peters-Lidard, M. J. Sale, A. W. King. 2004. A comparison of geographical information systems-based algorithms for computing the TOPMODEL topographic index. Water Resource Research, 40. Renslow, M. S. 2001. Development of a bare ground DEM and canopy layer in NW forestlands using high performance LiDAR. Int'l User Conf., ESRI. Schiess, P. and J. Tryrall, 2003. Developing a road system strategy for the Tahoma State Forest. Techn. Report, University of Washington, WA. Shamayleh, H,. and A. Khattak. 2003. Utilization of LiDAR technology for highway inventory. Mid-Continent Transportation Research Symposium, Ames, Iowa, August 21-22, 2003. Strahler, A.N. 1957. Quantitative analysis of watershed geomorphology. Transactions of the American Geophysical Union 38, 913-920.
o To identify non-industrial tax parcels either taxed as forestland by the county assessor or that are completely within a forested area. o To construct a spatially explicit GIS based dataset that identifies these parcels and their owners. Washington's non-industrial private forestland owners have, in the past few years, been burdened with many complex and often counter-intuitive forestland regulations. These regulations have been a considerable driving force in the conversion of forestland to non-forest uses. To help maintain the financial viability of Washington's non-industrial private forestlands the State recently began offering financial assistance to landowners whose property had some type of fish blockage in need of replacement. To help these owners financially, the State need to know not only where fish blockages are but whose property they are on to determine if they qualify for assistance. Unfortunately, most of Washington's 50,000+ non-industrial private forestland owners are not aware of County tax benefits associated with forestry and therefore are not identifiable by assessor land use codes. Remote sensing provides the opportunity to accurately identify forestland parcels regardless of the County assessor's land use code. ERDAS Imagine 8.6 was used to read Landsat 7 images and run a rectification process to eliminate atmospheric effects that exist in all remotely sensed images. Using orthographically corrected aerial photos as ground truth data, forest land was identified as well as other land cover types such as urban, agriculture, water, snow and clouds. ERDAS was then used to run a supervised classification of the land cover types identified using the ortho photos. The classified land cover classes were then overlaid on the county parcel data to determine which parcel were forested. Using ArcGIS 8.3, the classified Landsat data and the parcels were intersected to produce a dataset showing the proportion of each parcel that is forested. The results showed the non-forested parcels are in and around the urban areas. The result of the GIS intersection between the parcel and the forests indicated how many acres of a parcel are forested, the percentage of forest based on the total area of the parcel, and if trees exist in the parcel. With this information and other fields in the table of the intersection, we can identify whether or not a parcel may be non-industrial private forestland.